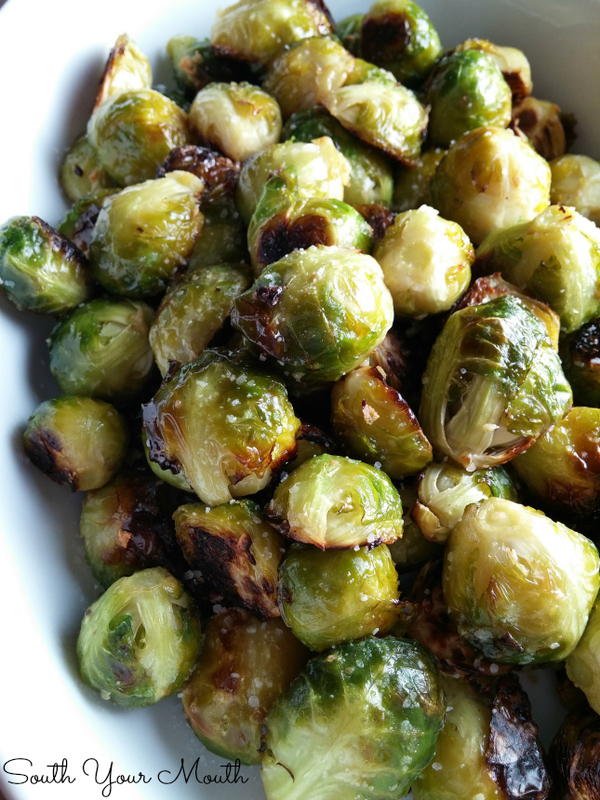 Brussels sprouts roasted with garlic, olive oil and sea salt (amazing with fresh shredded parmesan cheese to serve!). Plus tips for avoiding bitter sprouts. Man, I swear I could have been a vegetarian. If no one had ever let me taste a ribeye steak or onion sausage or barbequed chicken and I didn't know what I’d be missing, I could totally live off of vegetables. I love them. And I crave them. I think my body thwarts off illness and other bad juju by telling me what it needs by way of vegetable cravings. 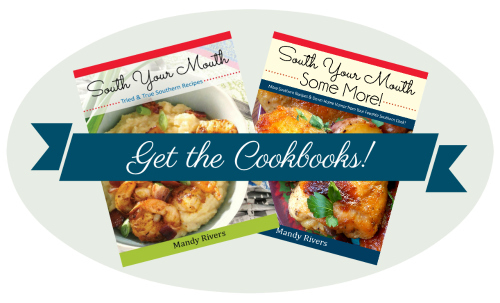 I love to cook large batches at a time and then eat on them all week. If I've got the grill cranked up, I go ahead and grill an extra bunch of asparagus or zucchini while I’m at it. If my oven’s already hot, I go ahead and roast what I have on-hand. I roasted a half head of cabbage and huge chunk of cauliflower the other day because I had it in the crisper. And it would likely have gone bad if I hadn't. When my fridge is full of already cooked veggies that I can just heat up at supper, we eat way more of them than the canned or frozen kind because roasted or grilled is just so much better! Oven roasting vegetables totally transforms them. A lot of the moisture evaporates in the hot oven so the flavors really get concentrated. The outside gets browned and caramelized while the inside stays moist and tender. Since no one else at my house likes brussels sprouts, I’m proud to tell you I single-handedly ate every single one of these gems from Sunday to Wednesday. And I’m itching to make some more! Smaller is better. Smaller, heavier brussels spouts are less bitter. Cut them in half. Opening sprouts releases the acidic compound in them that can make them taste bitter. Trim away as much of the stem as possible and any outside leaves that aren't tightly closed. 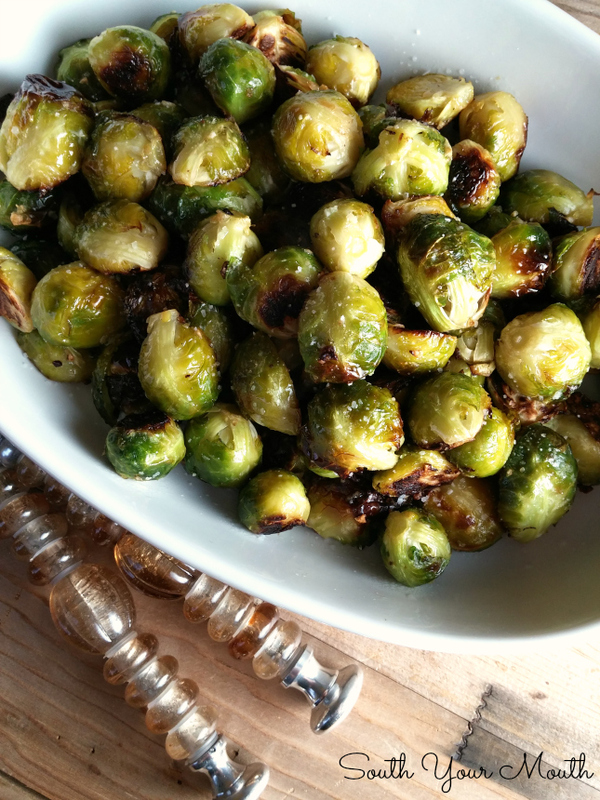 Like greens, brussels sprouts are best during the cold weather months. Sticky Chicken – Marinated slow-roasted chicken pieces braised in a slightly sweet, tangy sauce. Barbequed Steaks – Thinly sliced grilled steaks marinated then basted in a homemade barbeque sauce. Wash and dry brussels sprouts* then add to a bowl. Cut any that are larger than an inch in diameter in half (keeping the small tender ones whole). Toss brussels sprouts with olive oil, salt and garlic then arrange in a single layer in a large baking pan (or two smaller ones – use whatever you have to ensure the brussels sprouts aren’t touching and have plenty of room). Bake at 400 degrees for 18-20 minutes. Watch them closely. You want a nice roasted char on the bottom but there’s a fine line between charred and burned. To serve, spoon into a serving bowl then drizzle with additional olive oil and sprinkle with additional coarse grain salt. These are also amazeballs served with freshly grated parmesan. *TIP: Wash vegetables when you bring them home from the market so they are bone-dry when you’re ready to roast them. This ensures the oil and seasonings really coat the veggies. I just bought some Brussels sprouts last night, and told my husband I was going to try to roast them. Imagine how happy I was to see your recipe this morning !!! Can't wait to try them. I love these and have recently converted Hubby. I will NEVER buy frozen ones again! I usually sear mine in a skillet, then steam a bit. But I will roast next time. These look amazing! It's me again...anonymous Kathy ! 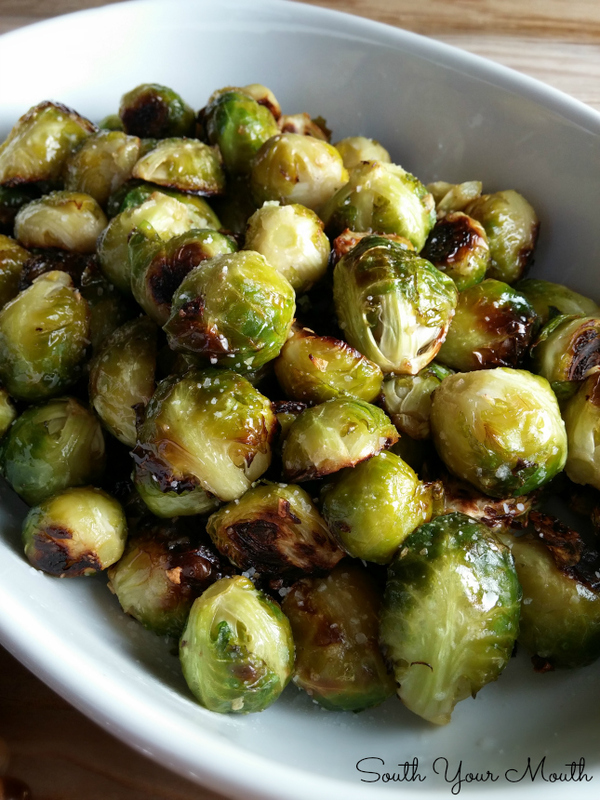 We had roasted Brussels sprouts last night, and my husband and I nearly fought over them...yum yum !! I will certainly have to buy a larger bag the next time. Next I'm eager to try other roasted veggies. Kathy, I'm so glad y'all enjoyed them!!! Thank you for letting me know! Would this work with frozen brussel sprouts if they were defrosted first? I also put in cooked bacon for something extra. It makes a big hit at family Holidays. I make 5 lbs of them. These were beyond FANTASTIC and a yummy way to get in Vitamin K which I definitely need. Thanks for sharing!! Made these 1/21/16, just as the recipe states and they were delicious!. Husband and I ate every last one. YUM!!!! Why do you say don't let them touch each other? You just want to make sure they have enough room to roast. If they're crowded and too close the moisture might not be able to evaporate and they will just kinda boil in the pan. 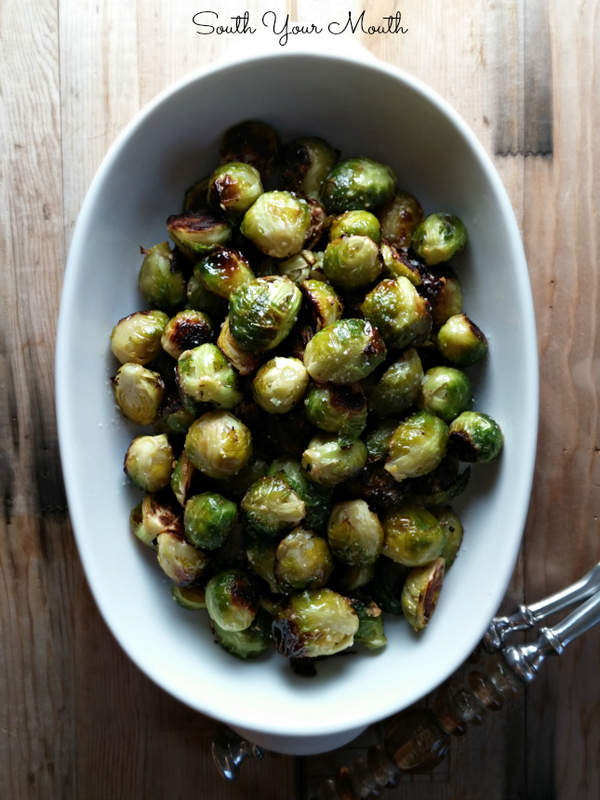 I am a HUGE sprout lover and always looking for other ways to add them to my menus. This looks like a great way! Hi Mandy, I make mine exactly as you do. Delish! I did want to add though, you CAN use frozen small BSprouts also. I put my bag of frozen ones in the fridge in the morning, when I get home they are thawed and then just slice in half and I roast mine in a cast iron pan, tuning every 15 minutes. In 30 minutes they are perfect. Plus the cast iron really chars them nicely. I made these for Easter Sunday. I added some diced bacon before roasting and I sprinkled freshly grated Parmesan on them as soon as they came out of the oven. OMG! They are AMAZING!! !